Heat Pump Sale- Call Now for this Special Offer-Save $300 off a New Heat Pump. Heat pumps have come a long way in the past 20 years. 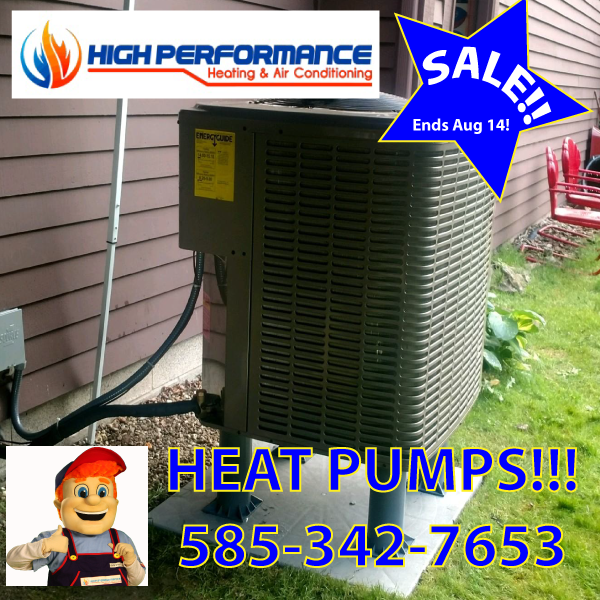 Call Today for heat pump installation specials and start saving on your heating system today! 18 Month financing on a new heat pump will get you warm and cozy, while saving money on your heating bills, Call NOW! Another Customer Happy Like Harold with their HVAC Installation. 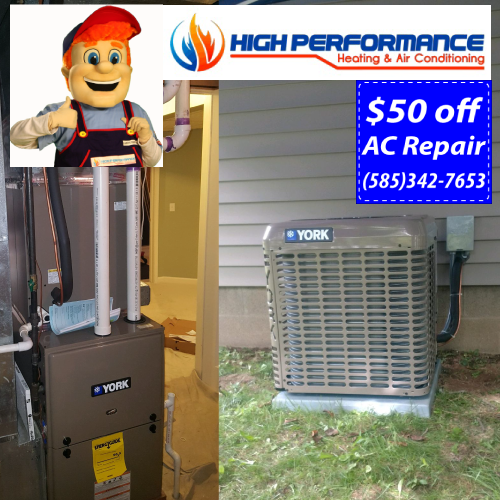 Call 585-342-7653 Today for AMAZING Specials on York Air Conditioning and Furnace Installation or Replacement Specials. Not Looking to replace the furnace? Use this $50 Off Coupon to get air conditioning service for your home, and be Happy, Like HAROLD!! 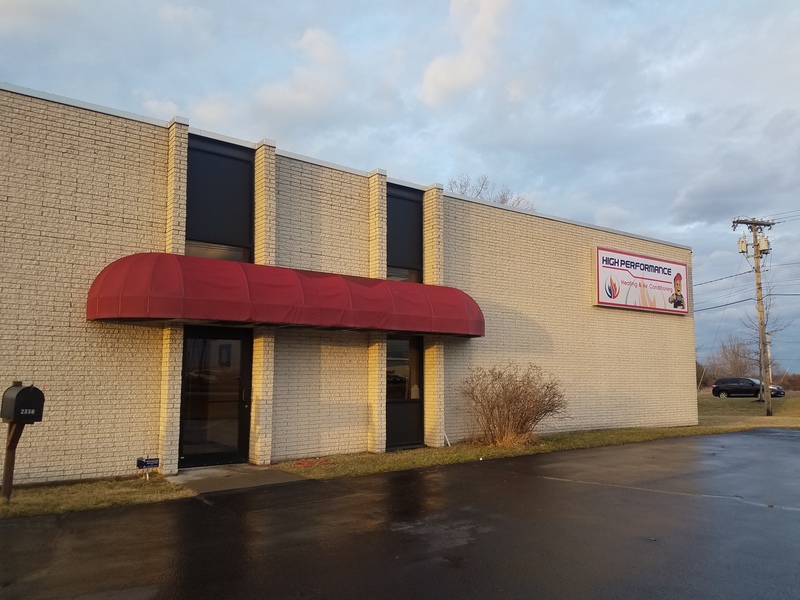 18 Month Financing on new HVAC installations High Peformance Heating and Cooling and Happy Harold bring you another satisfied customer with a new air conditioner replacement and furnace replacement. These folks will be happy for years with their equipment. Excellent financing options and well trained Technicians will arrive at your door within the promised time and repair your air conditioner correctly. You ask, Why a difference in price? Well, to keep it short, it boils down to the time it takes a properly trained and equipped hvac technician to install the equipment correctly. Whether it be a furnace, tankless water heater, air conditioner, heat pump, humidifier…….when it comes to your hvac system, but its that way with anything. Imagine the engine being improperly installed in your car! After a couple months, your money will have been wasted in repairs, and you will want to throw the system away. We see countless hvac systems that the improperly trained technician took two weeks to install a peice of equipment! Needless to say, the clients had nothing but issues with it. We have had issues, we are not perfect. However, our failure/call-back/issues rate is less than 1%. We have removed systems that we put in 20 years ago that ran flawlessly for the whole time. That is quality you can depend on, You trust, We care. Get more info at Our Cooling repair page! 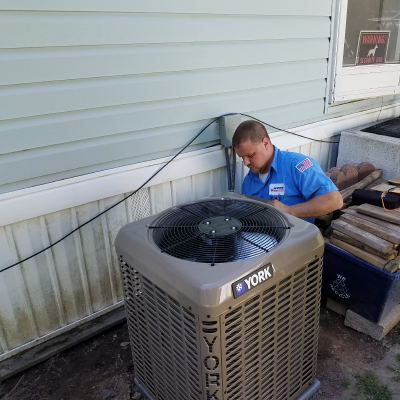 Our Partnership with York HVAC has allowed us to bring you incredible HVAC Air conditioning Installation deals, Call Today to Book your installation before their Gone! Our Expert Technicians will install or repair the ac system right the first time Guaranteed or your money back!Call 585-342-7653 Today! Should You have HVAC Service? Your Comfort depends on it. HVAC Service, and how often it has been done, could be the determining factor whether to replace or repair your HVAC Unit. There are many other factors to consider as well. Your old HVAC Unit is most likely a 10 SEER Unit, or basically rates as a 10 on the seasonal energy efficiency ratio scale. Well in the energy efficiency world, a 10 is not the best. A New 13 SEER HVAC unit can be as much as 42% more efficient as a 10 SEER. If your AC Is a really old 6 SEER Unit-A new basic 13 SEER ac unit can be as much as 72% more efficient-WOW!!! Efficiency differences are calculated with a couple of different factors, energy consumption, meaning how much actual electricity does the ac unit consume, and cooling output, or how much net cooling is actually outputted by the unit. If you have not had the HVAC service done on a regular basis throughout should be considered. Has your old ac unit had many repairs done to it in its life? Most ac units do not have many parts, typically only a handful. Air Conditioner Start components are average parts that usually last around 7-10 years, where as the compressor inside is the heart of the ac unit, that in today’s age, if the compressor goes, replacement of the ac unit should be highly considered. Other parts, such as condenser coil, expansion valves and evaporator coil typically will last the lifetime of the unit, however, over the past few years we have seen expansion valves prematurely failing more often. The refrigerant, or sometimes referred to as Freon, plays an important role in the decision to repair or replace the ac unit. Refrigerant #22, (the old stuff) was introduced as a temporary replacement to the best refrigerant of all time, R #12, in the early 1970’s. We had to find a different refrigerant to replace R #12 due to its concentration of chlorine, and chlorine’s effect on the ozone layer. R #22 was brought in as a temporary replacement to R #12 because although it still contains chlorine, its effect on the atmosphere only last 21 years, sounds like a long time, but R #12 is 100 years, big difference. In 2006, the government put an end to new ac units containing R #22, and the switch was made to R #410. R #410 does not contain chlorine and dissipates in the atmosphere almost immediately. What does all this mean when it comes to AC Replacement or Repair?? MONEY!! R #22 is at an all time high as far as cost goes, and it doesn’t seem to be going down anytime soon. If you need new refrigerant and your unit contains R #22, you could be spending 20% to 30% of the cost of a completely new ac unit just to replenish your R #22. Also if your unit contains R #22, then your unit is at least 10 years old which means start components, if not replaced already will soon go, and the other ac components we spoke about earlier are also prone to failure. A system that has repeatedly had to have HVAC Service done to it, and refrigerant added often, is a candidate for replacement. The Obvious. If you have never had your air conditioner tune-up done, or your HVAC Service done on a regular basis as a whole, or it has been in a poorly operating state for many years, the internal compressor windings could be weak, and you are on your way to a major ac unit repair. Once it begins, Acid will begin to form inside the ac unit compressor and it is all downhill from there. The acid will continue to build and eventually will cause the compressor to burn out. A Compressor burnout means having a well trained technician spend extensive time and money to clean the acid out and replace the compressor. Unfortunately, the acid can never be 100% removed and requires installing special filters inside the ac unit,which if are not replaced shortly after the installation of a new ac compressor, then will get the acid into the new unit and the degradation process will begin all over again. In Short , There are may factors to consider in the decision to repair or replace your ac unit. 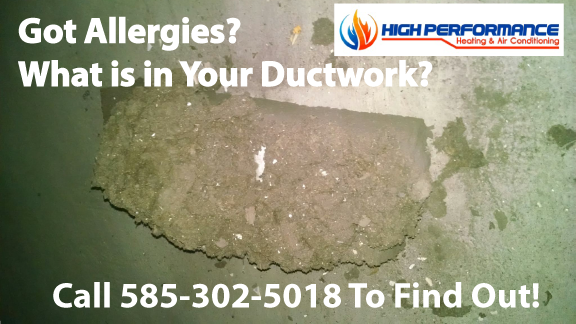 Questions, Call us at 585-366-0557 and we wil be happy to help. Fully licensed and insured, fully prepared for any job. All Heating system Installations come with full warranties – For details give us a call! Scheduling an appointment with High Performance Heating & Cooling means getting a certified HVAC technician when YOU need it. Our trusted technicians value your time; we guarantee the job will always be completed in a timely manner and to your satisfaction. Need a trusted HVAC Contractor for Your Home? Finding an HVAC company that you feel comfortable with can be a long process. We’ve made the decision easier for you by providing high-quality services at an affordable price. Professional technicians are determined to restore comfort and safety back to your home at a cost-effective price. 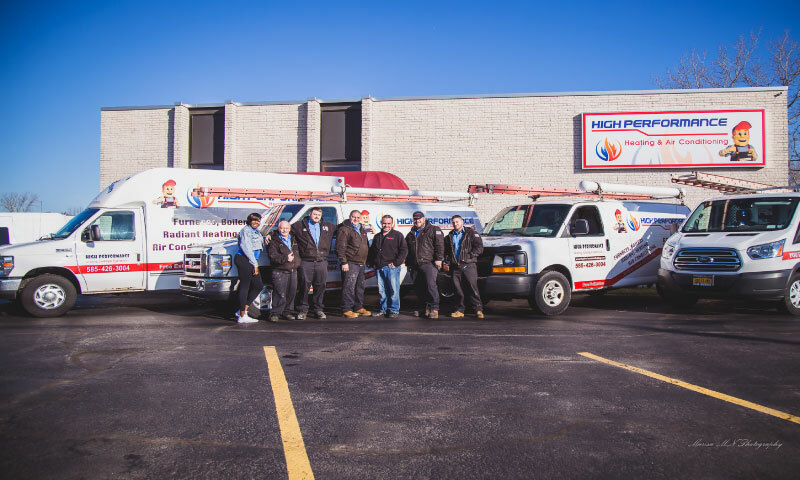 Our expert HVAC technicians will arrive on time in marked trucks wearing company uniforms. Faith in our technicians, techniques, and customer service help us to back every service with a 100% customer satisfaction guarantee. This Boiler was in need of MAJOR Repair- Improper Combustion Caused the Sooting of the boiler to fill This Gentlemen’s House with Carbon Monoxide. 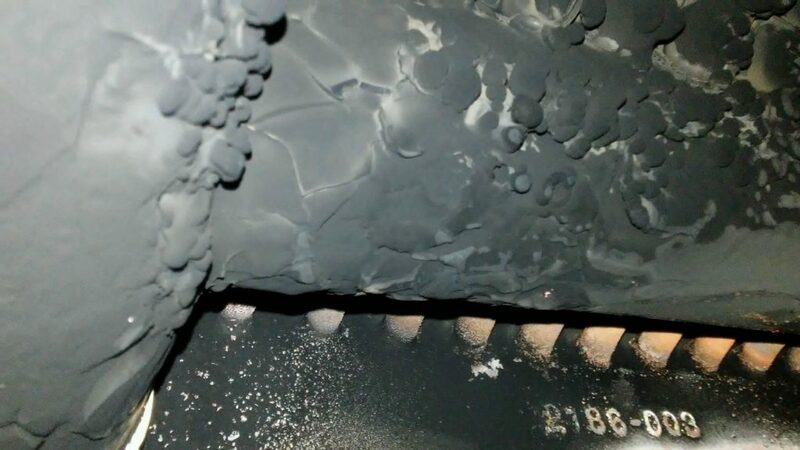 His Boiler was leaking water as well causing the burners to completely rot out. Natural Gas was pouring from the end of the burners, lighting, then (thankfully) the water was putting out the flame. Great to save from an explosion, but horrible for the headaches. The Experts say that it is colorless and odorless, however, a well trained HVAC Technician can detect the odor of improper combustion, often the leading culprit of CO Poisoning. These can be acidic taste on your tongue, black powdery substances on window sills, and most often, complaints of headaches, nausea, and of being tired all of the time. Why Wait, Have Your System Checked out for Carbon Monoxide Today! 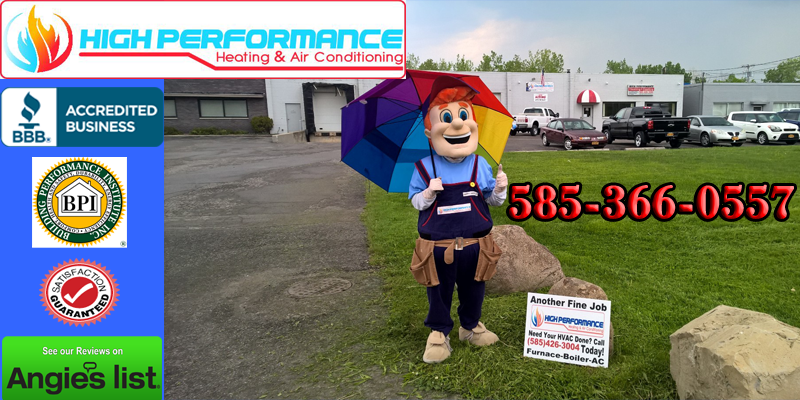 Don’t Take the Chance-Call High Performance Heating and Air Conditioning for a low cost HVAC Maintenance visit to be sure your system is operating at its Maximum Safety and Efficiency Levels-585-302-5018-Just Call HAROLD!!! 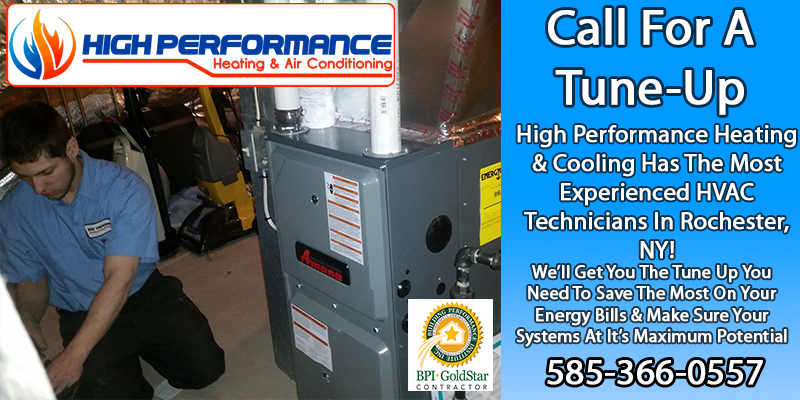 !Call For Your Furnace or Boiler Maintenance Today! Heating Season Is Here-Is Your Heating System Tuneup Done? 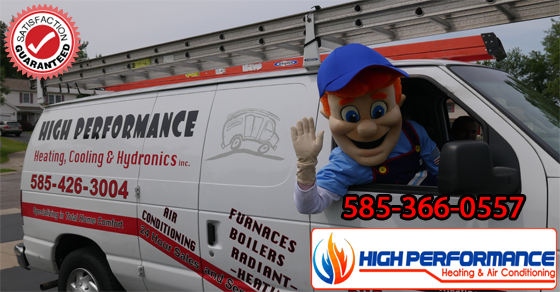 Heating Season Is Here-Is Your Heating System Tuneup Done Yet? Furnace tuneups are key to making sure your HVAC system is up to snuff before the cold weather. Furnaces are less likely to fail if a trained technician has gone through it to flag anything that may cause the heating system to fail. 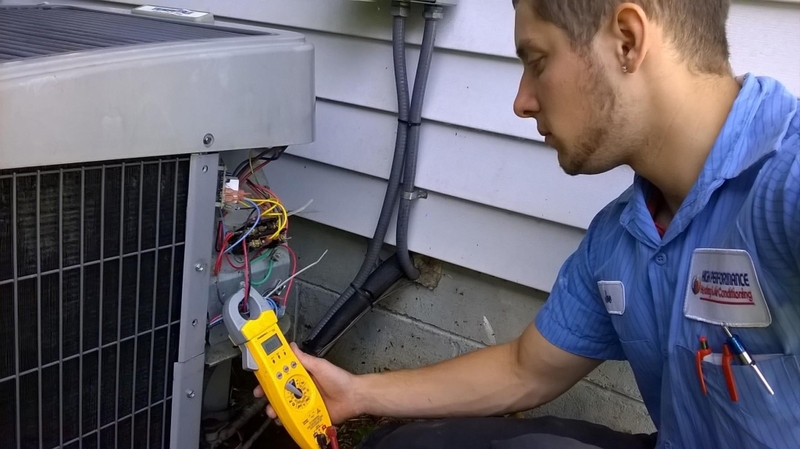 There are small sensors, drains, burners, motors and all types of other components that if gone unchecked will wreak havoc on an older hvac system. Heating and air conditioning systems that are not maintained are simply inviting a costly breakdown, and when does it break, Christmas!! It could have broken in a way that it would only actually fire after 10 or 11 attempts, causing a temperature swing in the home, yet still keeping the home relatively comfortable. Why do you ask? When it did fire, the place would warm up a little. The only thing that seemed wrong were the energy bills were high and the thermostat was never actually at the temperature setpoint. Any Thermostat should keep the home at least within 2 degrees of setpoint. Most of the Hot Water Boilers that we see that are broken are ill-maintained, and when it has gone on too long, it is expensive. Not just the boiler repairs expensive, but the damage created, (whether it be water on the floor or all over the basement), can be costly. Water boilers are different because tuneup issues could be effecting operation unnoticed, for example, we had a customer this year that thought the upstairs was just colder, low and behold there was not even any water in the upstairs heating system!!! This has most likely cost him thousands of dollars more in his heating bills over the years that his boiler was not tuned up. Our trained technicians are the best when it comes to hot water boilers, don’t let lack of a proper hvac tuneup cost you money. View our Specials and get on the schedule today before emergency boiler repairs are part of your future. Last season we removed and reinstalled over 20 pieces of heating equipment installed by other companies. Our fail safe methods of HVAC equipment replacement ensure that the system you are paying for will live its full life without costly breakdowns do to a poor installation. Its the little things that are the most important when it comes to your install-Dont be fooled, Get it Installed by High Performance Heating and Harold and the crew will make sure you are all set. Air Conditioners-Repair or Replace? The ultimate question when it comes to your old AC Unit. There are many factors to consider. Your old AC Unit is most likely a 10 SEER Unit, or basically rates as a 10 on the seasonal energy efficiency ratio scale. Well in the energy efficiency world, a 10 is not the best. A New 13 SEER ac unit can be as much as 42% more efficient as a 10 SEER. If your AC Is a really old 6 SEER Unit-A new basic 13 SEER ac unit can be as much as 72% more efficient-WOW!!! Efficiency differences are calculated with a couple of different factors, energy consumption, meaning how much actual electricity does the ac unit consume, and cooling output, or how much net cooling is actually outputted by the unit. Has your old ac unit had many repairs done to it in its life? Most ac units do not have many parts, typically only a handful. Air Conditioner Start components are average parts that usually last around 7-10 years, where as the compressor inside is the heart of the ac unit, that in today’s age, if the compressor goes, replacement of the ac unit should be highly considered. Other parts, such as condenser coil, expansion valves and evaporator coil typically will last the lifetime of the unit,however,over the past few years we have seen expansion valves prematurely failing more often. The refrigerant, or sometimes referred to as Freon, plays an important role in the decision to repair or replace the ac unit. Refrigerant #22, (the old stuff) was introduced as a temporary replacement to the best refrigerant of all time, R #12, in the early 1970’s. We had to find a different refrigerant to replace R #12 due to its concentration of chlorine, and chlorine’s effect on the ozone layer. R #22 was brought in as a temporary replacement to R #12 because although it still contains chlorine, its effect on the atmosphere only last 21 years, sounds like a long time, but R #12 is 100 years, big difference. In 2006, the government put an end to new ac units containing R #22, and the switch was made to R #410. R #410 does not contain chlorine and dissipates in the atmosphere almost immediately. What does all this mean when it comes to AC Replacement or Repair?? MONEY!! R #22 is at an all time high as far as cost goes, and it doesn’t seem to be going down anytime soon. If you need new refrigerant and your unit contains R #22, you could be spending 20% to 30% of the cost of a completely new ac unit just to replenish your R #22. Also if your unit contains R #22, then your unit is at least 10 years old which means start components, if not replaced already will soon go, and the other ac components we spoke about earlier are also prone to failure. The Obvious. If you have never had your air conditioner tune-up done, or it has been in a poorly operating state for many years, the internal compressor windings could be weak, and you are on your way to a major ac unit repair. Once it begins, Acid will begin to form inside the ac unit compressor and it is all downhill from there. The acid will continue to build and eventually will cause the compressor to burn out. A Compressor burnout means having a well trained technician spend extensive time and money to clean the acid out and replace the compressor. Unfortunately, the acid can never be 100% removed and requires installing special filters inside the ac unit,which if are not replaced shortly after the installation of a new ac compressor, then will get the acid into the new unit and the degradation process will begin all over again.